Around this time last year, we shared a list of 10 productivity tools for small business owners. Today we continue to use some of them in our daily workflows including Zapier, ProfitWell and FocusBooster. In fact, we've built direct integration with Zapier so that you can create zaps between CozyCal and over 500 other apps through Zapier to automate repetitive and time-consuming tasks. You can read more about four of our favorite zaps here to see how to better streamline your scheduling process. For the remaining tools, we replaced some of them with more efficient ones. For example, we replaced MailChimp and Zendesk with Intercom, which is a customer messaging and emailing platform that allows us to chat with customers and leads in real-time as well as to send automated email campaigns. 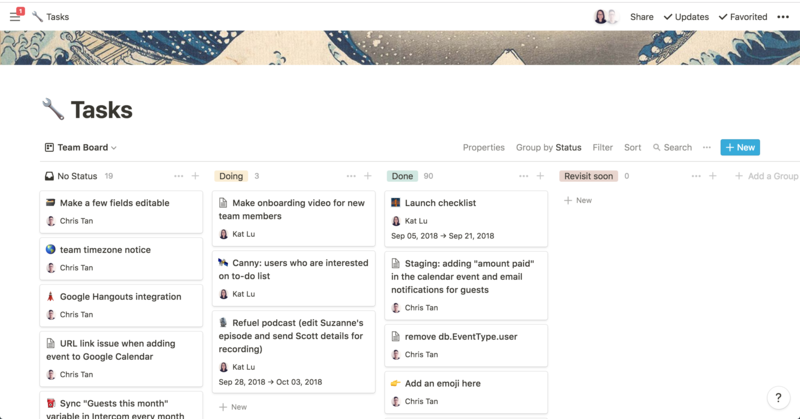 We also replaced Evernote, Trello and Teux-Deux (to-do list app) with a powerful all-in-one knowledge management tool Notion which I will discuss more below. In this post, we want to share with you three tools that are deeply integrated with our workflows in running CozyCal. They have helped us increase our efficiency in project management, task delegation, team coordination and feedback collection. Let's dive in and take a look at why they are special to us. While the world is not in shortage of to-do lists, project management and note-taking tools, Notion is truly a force of its own. It's an all-in-one workspace tool that you can take notes, archive information, manage projects and even create simple databases. Chris and I use Notion both for managing CozyCal workflows as well as personal affairs. We've made Notion the headquarter for CozyCal's operation. Ranging from setting up Kanban boards for issues, drafting blog posts, archiving design portfolios to planning road trips and recording light-bulb moments, I can organize all of them in Notion. Notion's flexible, swiss-army-knife capability is what appeals to me because it saves me a lot of time and headaches switching back and forth between ten thousand different apps. Besides equipped with powerful features, Notion is stunningly beautiful. We're blown away with its Zen elegance and state-of-art design. You know how working in a beautifully designed environment just feels delightful right? That's what Notion makes me feel. It creates this pristine and Zen-like digital environment in which I can immerse myself to focus on checking off tasks and creating content. While I use the desktop version the most, Notion has apps for both iOS and Andriod users, making the transition between different devices seamless. It also comes with affordable pricing scheme of just $4/month for the personal plan and $8/month per member for the team plan. 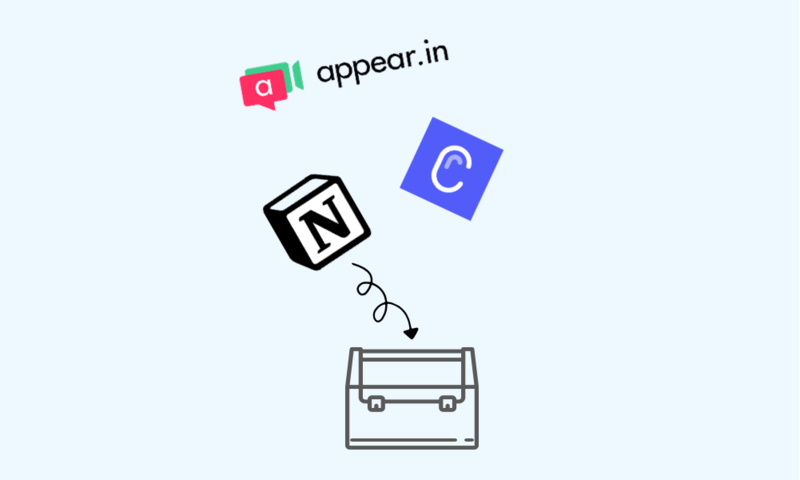 Now we are on the team plan because we store documents and images in Notion, and the free plan is only limited with 5MB of storage. To us, being able to achieve digital Zen state of mind at the cost of 2 lattes per month per person is a worthwhile investment. We have created a Kanban board for CozyCal's tasks in Notion that can be viewed as a board, a table and a calendar. Simple and flexible. I drafted this blog post in Notion. Feeling inception-like? A couple of months ago, our friend James from Systems Matter asked us if CozyCal could be connected with Zoom or Google Hangout through Zapier to generate video-conference room links for booked events. However, to zap with Zoom, a paid Zoom account is required and that would add additional cost to CozyCal users. In addition, Zapier doesn't support Google Hangout currently. This issue sent me on a scout mission looking for a free conferencing tool that can be easily added to CozyCal's scheduling process. Eventually, I came across a free and easy-to-use video calling tool Appear.in. As a side note, the company is based in Norway which I think is pretty cool. 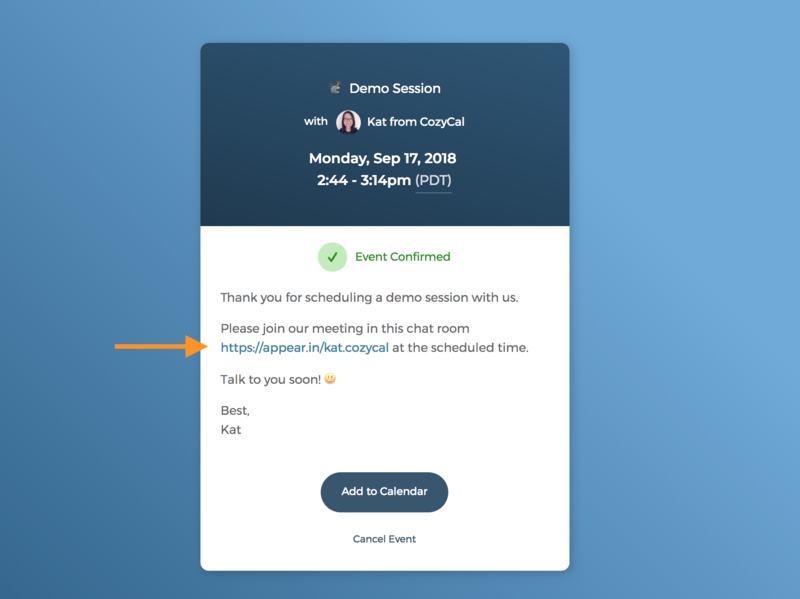 After signing up for a free account with Appear.in, I claimed my own chat room at https://appear.in/kat.cozycal and embedded this link in the event confirmation message, confirmation email and reminder email for CozyCal's demo session. When a guest books a demo session with me, they will receive the chat room link in the emails as well as their calendar event. At the demo session's scheduled time, they will knock on the chat room's door and then I will grant them access to enter for the video call. So far, it has been working great for me as I can share my screen and send chat messages with guests in the chat room. If you have events that need video-conferencing, you can create an Appear.in chat room and embed it in your CozyCal's booking page. We're on the free plan now which allows 4 participants and 1 chat room. But if you have a bigger team or need to host more guests for the video call, their pro plan is at $9.99 per month. You can embed your chat room's link here for events that need video-conferencing. â€�Chris and I are having a conference call to check in. Did you spot the panda in the background? Collecting feedback from users is one of the most important tasks for CozyCal. Every day, we have customers submitting their feature requests and feedback. With the invaluable input from our users, we are able to iterate constantly and prioritize the most important features to build for CozyCal. In the early days, manually tracking feedback is not an issue since the feedback volume was low. But as we have more users onboard now, automating feedback collection could save us a decent amount of time. Initially, we tagged chat messages to gather feedback on Intercom, the chat messenger we use to talk to users. However, the tagging system doesn't work that well with collating and organizing feedback. Since then, we have been seeking a solution to automate this process. We came across Canny on Indie Hackers, an online community for people who are bootstrapping (starting businesses with no external funding) software businesses. It turns out that the creators of Canny, Sarah and Andrew, are also a couple who are building Canny from the ground up. We have created CozyCal's roadmap in Canny that displays the list of feature requests our users have submitted. 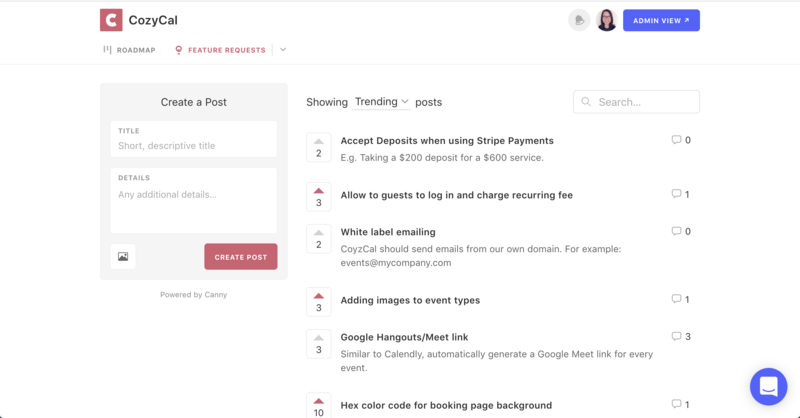 Cannyâ€˜s simple interface helps us to capture feedback in one organized place. Based on the number of upvotes, we can prioritize and build the right features for CozyCal. Another benefit of using Canny is that it gives our users the flexibility to submit feedback of their own accord. When you click on "Get Help" on your CozyCal dashboard, you will be led to our roadmap on which you can either upvote existing features or submit new ones. Whether you are running a service-based or product-oriented business, customer feedback is most likely to be integral for your business's health. If your business requires constant input from users, then Canny is an excellent solution to automate this step. You can upvote existing features or submitting new ones on our product roadmap on Canny. Those are the three tools we recommend. They have helped us to systemize our workflows and be more organized. We hope that you will get a chance to check them out and see if they can be part of your business's operation as well.